Doha, Qatar, 18 March 2019: The partnership between Qatar Finance & Business Academy (QFBA) and MUFG is growing from strength to strength. QFBA Kawader interns 2018-2019 were hosted by MUFG at its international offices in their efforts to contribute to the Qatar National Vision 2030 vision. The continued and ever-growing collaboration between MUFG and QFBA Kawader, has been working to create expansive and challenging opportunities for the program. The program, which provides learning opportunities for those interested in developing their skill set and knowledge of the financial services arena, this year saw interns seconded to London in Structured Finance, Hong Kong in Global Markets and Singapore in Project Finance. MUFG hosted 3 interns of the Kawader 2018-2019 cohort. To date, it has hosted all 24 interns at their International offices. As part of the program, Kawader interns are provided a challenging atmosphere focused on developing their skills to tackle real market environment. Every training experience is constructed in a way to cater to their knowledge expansion and enhancement of expertise in the selected field. They are also exposed to the international financial playground of world-class markets. 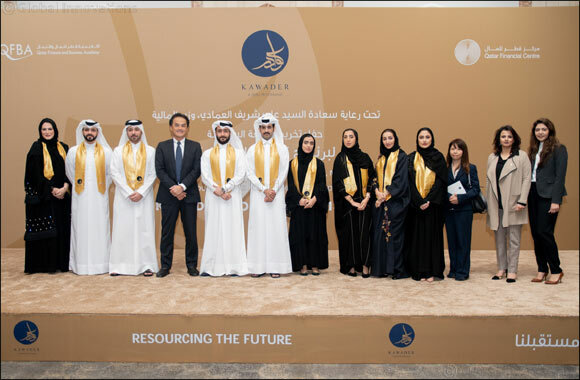 Katanori Otsuji, Head of MUFG’s Doha branch, said: “We at MUFG are honored to have supported the Kawader program since its inception by offering Qatari students internships at our offices around the world. My colleagues and I are always impressed by the enthusiasm and competence of the students who join our teams, as well as their ability to make a lasting impression within a short space of time. MUFG is the first financial group to host QFBA interns internationally in London and Asia. Having completed its fifth year with QFBA with the 2018-2019 cohort, MUFG is vested in continuing this support. The Kawader program is a training internship, which aims to provide best-in-class experiences to interns for a minimum of four weeks. The initiative hopes to encourage interns to take up careers in financial services, and to create greater collaboration with the academic sector. With such initiatives, QFBA further reiterates its commitment in taking the Qatari financial services sector to the highest standards by empowering the local human capital with world-class education, thereby contributing towards the realization of an important pillar in 2030 vision, The Human Development pillar.